15 Laura Drive, Addison, Illinois 60101 U.S.A. Fully Interlocked flexible metal tubing, .010" - .012" metal. Fully interlocked flexible metal tubing .013" - .015" metal (call for specifications). Fully interlocked flexible metal tubing .017" - .020" metal. Larger sizes to 20" available. 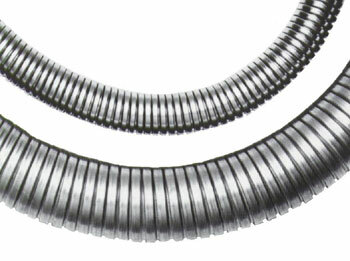 Type 3003 aluminum flexible duct. Sizes to 16". Positive Seal stainless steel band clamps. Continuous tube of flexible, electro-galvanized, rust resistant steel, with a heavy rubber packing, provides gas-tight performance under normal operating conditions.